Creation/Nature - The Juncos are back for the winter. Saw my first one on Tuesday the 11th on the deck for the birdbath. They're so cute with their pink beaks. We have had one with a white spot on it for many years now and I'll be looking to see if that one returns. 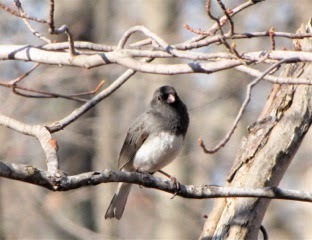 More info on Dark-eyed Juncos. As I write this I'm on the screened porch on a delightfully surprising day of 64 degrees and sunny. Stillness with only a few leaves dropping here and there. Speaking of leaves, the squirrels have been having a grand time playing in the leaves chasing each other and digging to find the acorns that had fallen beneath the leaves. The birdbath has been very busy with bathers on such a great day for cleaning feathers. Titmouse, chickadee, finches with the squirrels getting a drink in between. They usually drink from the pond, but there's a couple that seem to like the birdbath water better. 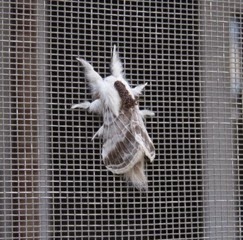 Our friend, Ken Bushell, sent me a picture of an amazing looking moth that stayed a good part of the day on the screen of his porch. Although research shows it's a common moth, we've never seen one here in our wildlife habitat. At first glance I thought the brownish blob on its back may have been something parasitic, but it's all part of this Large Tolype Moth (Tolype-velleda). It's really quite beautiful! Since it's so widespread, I thought I'd share it with you in case you've had them in your habitat. Leave a comment on the blog post if you have and let us all know. Read more about this beautiful moth. Charlene Buffum sent me a link to a squirrel video taken after the home/birdfeeder owners put Vaseline on the feeder pole. It is so funny to see the various ways the squirrel tried to get up to the feeders. Hilarious! And the couple that did it were laughing also. The feeder is in a dense garden area as you can see and there is some kind of plant with a thick stalk that is certainly stout enough for the squirrel to climb it and jump across to the feeder. We don't know the end of the story, but I betcha the squirrel won this battle .... they seem to win them all in some way or another. View Slippery Squirrel Video. I had mentioned in the last newsletter about the Common Grackles that were flying through in large flocks. One morning they were so loud I went outside to see many trees covered in them. It was a perfect moment for a video. The sound was almost deafening and yet above that you could hear the "swoosh" of the wing beats as they changed directions flying in formation. Such an incredible display of wonder. View Grackles Swarming Video. 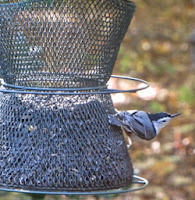 We have the White-breasted Nuthatch here in Virginia. When we lived in Alabama we had the Brown-headed Nuthatch. They are sweet little things to watch since they go down trees head first. They are insect eaters and are always looking for bugs in our dead trees, but they also visit our sunflower feeders for a special quick treat. Recently I took a pretty pose of a picture of one on the feeder. Spiritual - I've been really enjoying scheduling my day around several times with the Lord. I begin the day with the Lord before I ever get out of bed. What we think on at the first part of the day is very influential on the rest of the day. What we think on when we go to bed is what will be magnified during the night, so that's another time to focus on God's Word. Instead of telling your problems to God, why not tell your problems about God's Word. The Word will change your circumstances if you put more of it in your mind than rehearsing the problem. Yes, you can get a lot of pity from telling others, but what does that do for you? There are many mighty men of God in history that spent many hours with the Lord, saying that they couldn't get anything they needed to do done with more time, but with more fellowship with God, it all came together. So that's what I set out to emulate. Something I've done for a very long time is to designate shower and toilet time to meditation on the Word of His promises. It produces much more peace and joy than worrying over all your troubles and actually makes them become a bit more faded as you do so throughout the day. When the desire is there, you will find the time, and it's definitely better to do so before you reach a crisis in your life. There's a difference between relationship and fellowship. When we take Christ as Lord, we are now in relationship to God, a son or a daughter, but fellowship is what God created us for as can be evidenced by His daily walking and talking with Adam and Eve in the Garden of Eden. 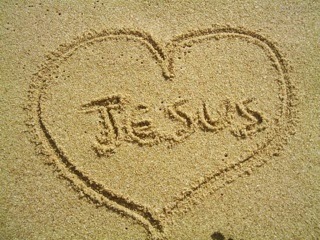 I like to go to sleep picturing myself dancing with Jesus on the beach until we're exhausted and then sit in the sand and draw pictures or build sand castles. What pictures does this verse create in your mind? It's one of my favorites! "The LORD your God in the midst of you is mighty; He will save, He will rejoice over you with joy; He will quiet you with His love, He will rejoice over you with singing" (Zephaniah 3:17). We don't have any children at home and my job is at home so I can schedule my time. But even with children we can find 10 minutes to focus on fellowshipping with God several times a day. And those who work outside the home have a commute of some sort, which is a perfect time. Certainly better than listening to the evil of the day (CNN - Continually Negative News) or talk shows of people puking their guts out about some issue that they have no control over, can do nothing about or will do nothing about, but feel better themselves after dumping the garbage on an audience. There's also break time and lunch time. Spending time with God will bring you more peace and joy than gossiping at a break table or listening to others who dump the worst news of the day on your lap just in case you missed it. I've been missing it for over 30 years and have never actually missed anything. Have bad circumstances going on? Get into the Word and find promises relating to them and focus on the promises, not the problem. Whatever we focus on will be magnified in our lives. What do you think on most of the day? How's that working for you? Does meditating on the problems produce any peace or change in your circumstances? I often think about Daniel's fellowship with God. He prospered in a foreign land and was elevated to high offices. Daniel was honored by King Nebuchadnezzar and placed in authority over all the wise men of Babylon. Later King Belshazzar reigned and he promoted Daniel to the third highest position in the Babylonian kingdom. 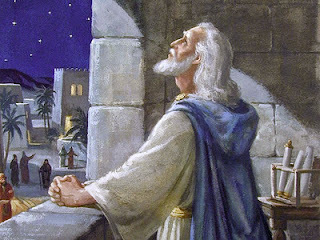 King Darius then took over and those who envied Daniel's prosperity and favor wished to kill him so they had King Darius issue a decree forbidding his subjects from praying to any of their gods for the next thirty days. The penalty for disobeying was to be thrown into a den of lions. Three times a day Daniel would pray and this could be seen from his bedroom window. So Darius was forced to submit Daniel to the lions' den and we all know the outcome of that. Daniel's honesty and loyalty to his masters never led him to compromise his faith in the one true God. I've often wondered if he felt the need to pray three times a day due to all of the evil around him. The world he lived in under foreign rule with false gods was surely as tough as ours is today with all the evil going on around us. Did he find his peace and other Godly qualities in fellowship with the Lord at these times. Is it how he kept his head above water? I believe it was. 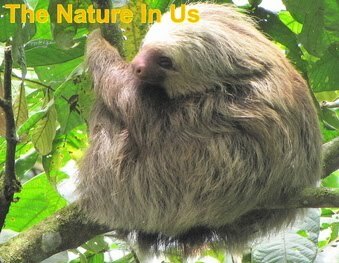 How much more do we need an escape from the overwhelming stress of the world today? Health - Don't miss the post on toenail fungus. There are only a few anti-fungal drugs and all are very toxic, but there are some natural alternatives that work well. Check out this post: 11 Home Remedies For Toenail Fungus. For those of you who enjoy electrolyte drinks, you might want to check out this article to make your own healthy mineral-restoring beverages. Most of the drinks available have a list of very unhealthy ingredients in them. Making your own you can use honey instead of refined sugars and high-fructose corn syrup: Make Your Own Electrolyte Energy Drink. Travel - Thank you again to my friend, Charlene, in N. California, for the introduction to Socotra, an island situated in the Indian Ocean 155 miles (250 km) from Somalia and 211 miles (340 km) from Yemen. Like the Galapagos Islands, this island is teeming with 700 extremely rare species of flora and fauna, a full 1/3 of which are found nowhere else on Earth. The unusual flora in the photograph has been described as blooming elephant legs. 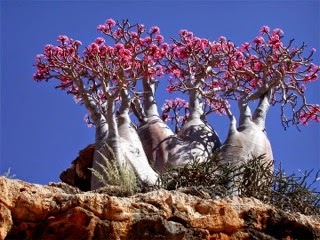 To me they look like upside down elephant legs, but this plant is called the Desert Rose. Some of the plants require no soil and sink their roots into rock. This place is a birder's paradise with 140 different species of birds with 10 not found anywhere else in the world. It looks like an absolutely fascinating place to rediscover who you are amongst so much of what you've never seen. Although taking advantage of the eco-tourism trade, you will hardly run into tourists when you visit this island of 40,000 inhabitants. The Yemeni government began putting roads in after negotiations with UNESCO, which declared this island a World Natural Heritage Site in 2008. I would prefer a camel ride myself, a slower pace at which to see things and as large as these plants are, you'd get a better view from a camel than a Jeep. View more photos and information here. Learn more about Socotra at Wiki. Ready to schedule a vacation? Here's a link for tourism info. Reuse/Recycle/Frugal - I love to recycle, but more than that, I like to reuse rather than just recycle it back into the environment. 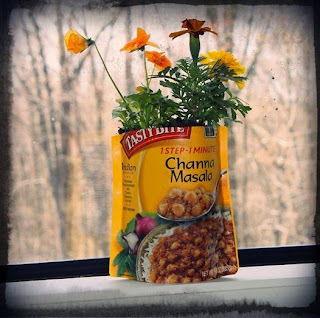 I saw this photo which mentions using the packaging as a pot to plant flowers in. I thought it was a cool idea. What a nice way to present a garden gift to neighbors, friends, co-workers, etc. when you are thinning out your own garden beds. You could make the day for somebody with such a simple gift. And they will have that beauty in their midst for quite some time. No garden to dig from? All you need is to buy a 6-pack of bedding plants for $2.00 or less. Add a bit of dirt to this kind of container or something similar and one of the plants. How many could you bless from a $2.00 investment! Life is hard at times and even a smile makes a difference in people's lives these days. You don't see many people smiling when you're out and about. The least I can do is share smiles with everybody I see while I'm out. A smile is a powerful seed to sow into the Kingdom and when you give it with one of these gifts it would be even more lasting. "Now thanks be unto God, who always causes us to triumph in Christ and Who makes manifest through us the savor of His knowledge in every place" (2 Cor. 2:14).